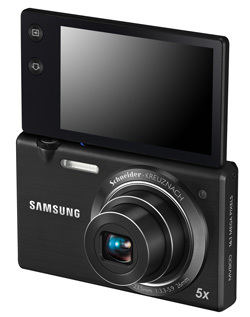 Samsung unveiled its new MV800 camera, a 16MP ultra-compact point-and-shoot with a 5x optical zoom, 26mm wide-angle lens and 3.0” capacitive touchscreen flip-out LCD display. The flip-out display comes in handy for shooting at high or low angles, and will flip completely forward for self-portraits. Samsung takes advantage of the 3" display on the MV800 with a completely revamped menu system that uses an "app-style" navigation menu layout that will look familiar to those with Android phones. You can scroll through five pages of "apps" to change camera settings and apply a plethora of special photo effects, and apps can be moved between pages so you can group those you use most in one place. I found the new menu layout to be very intuitive and a welcome change from standard camera menus. But don't be confused by the similarity with Android, the apps are limited to just the functions within the camera. For a little playfulness, the MV800 "Smart Filter" offers 14 artistic effects and "Funny Face', which allows you to contort portraits of loved ones by tapping and dragging to radically distort facial characteristics (think of the "pudding face" advertisements for Jello and you get the idea). The MV800 will also shoot photos in 3D and output them to a 3DTV. The Samsung MV800 will be available in stores later this month for $279.